Alvito is a lovely town located in the central region of Alentejo of southern Portugal. With Evora and the Serra de Sao Mamede Nature Park so close by, it provides a wonderful combination of history and the great outdoors. The festivals in Alvito take place in August and November which will certainly add a difference to your visit. They usually include setting off rockets which was the tradition in days gone by as a way of summoning the people to begin the processions. To complete your stay Alvito has its own Pousada, the Hotel Castelo De Alvito which was formerly a 15th century castle and now a luxury hotel. Its architecture is a mixture of different styles including Mudejar, Gothic and Manueline with round towers and high walls that are not typical of this region. It is very well known in the area for its excellent wine cellar of local regional wines and has a superb garden, swimming pool, restaurant and a bar which was originally the old keep of the castle. There are many nature trials and excursions in this area which you can either do by canoe, on bikes or horseback. The Serra de Sao Mamede Nature Park has several places of interest to explore such as the walled town of Marvao and Castelo de Vide where the largest Jewish community in Portugal lived. It is a combination of Atlantic forest and Mediterranean bush which means there is very rich vegetation including some extremely rare plants such as the Trumpet Narcissus and Stonecrop. There are also European royal deer roaming through the park and because it is also an important nesting area you will have an opportunity to spot some magnificent birds such as the Bonelli Eagles, Grey kites, Black Storks and Griffon Vultures to mention just a few. 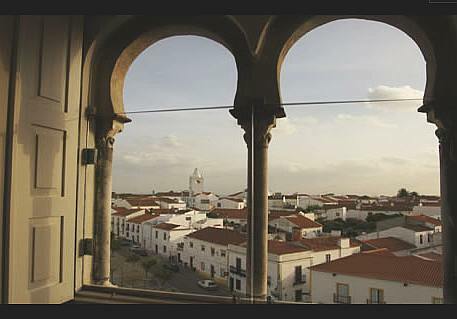 The World Heritage city of Evora is located in the Alentejo plains and is surrounded by a fortified wall. There are many fascinating buildings to visit while you are there such as the Cathedral, which is the largest in Portugal, and the 2nd century Roman temple of Diana. Other sites are the beautiful square of Praca do Giraldo and Rua das Casas Pintadas, a street of painted houses. One of the chapels in the Igreja do Colegio contains the large wooden crucifix which was always carried at the head of processions led by the Inquisition. The marriage of Gothic and Moorish styles is probably most recognisable in the Igreja de Sao Francisco with notable features on the facade such as the porch with its both pointed and horseshoe shaped arches. However without a doubt one of the most unique tours you might ever experience is the Capela dos Ossos where the bones of no less than 5,000 nuns and monks are embedded into the walls. If culture and nature make an attractive combination when you are on holiday, Alvito and Evora will certainly be able to meet all your needs. The nearest airport is in Lisbon which is approximately 150 km away and has car hire available if you wish to be free to explore the countryside at your leisure.